A surprise this morning—an e-mail from Belgium. 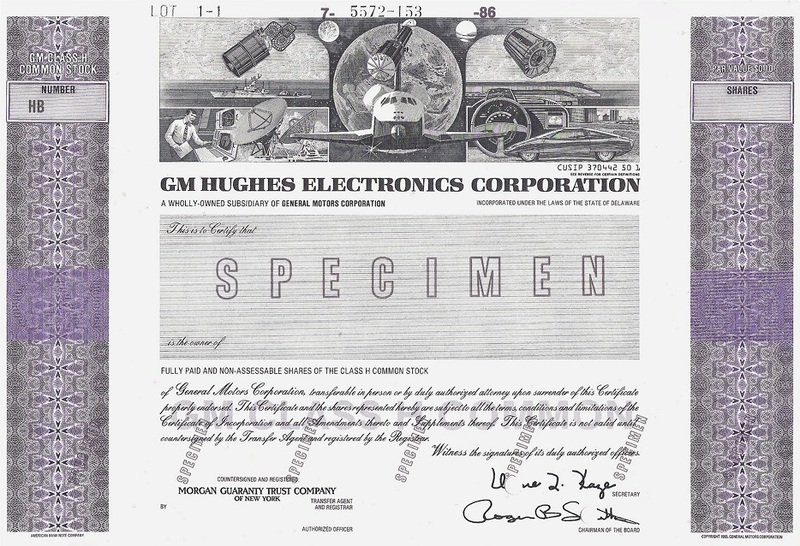 It came from Franky Leeuwerck who offered to provide an image of a General Motors-Hughes stock certificate. I told him I was interested and he sent the image below. He purchased this certificate on E-bay. Franky is a scripophilist—I didn’t know what that was either. A scripophilist is someone who collects and/or researches obsolete, antique, cancelled securities. His specialty is stock and bond certificates from companies that designed or manufactured computers (general purpose or industrial control computers or any digital programmable device) and this led to his interest in Hughes Aircraft. He operates his own scripophily blog at http://leeuwerck.blogspot.be/. He has compiled a collection of notes regarding the history of Hughes. These notes, while not complete, provide an outline of our history. I will call his attention to additional historical items of interest on our website. The seminal event that led Hughes into the space arena occurred on September 23, 1959. This was the cancellation, by the Air Force, of the North American F-108 Rapier Mach 3 long-range interceptor. The aircraft was intended to counter the threat of Soviet bombers carrying nuclear weapons. This aircraft was to be equipped with the Hughes AN/ASG-18 radar, the first airborne pulse-Doppler radar that enabled look-down shoot-down interception and an integrated fire control system. Each F-108 was to be armed with three Hughes GAR-9 Super Falcon long-range missiles. By 1959, according to Ken Richardson, these programs represented 40% of Hughes business. As a result of the F-108 cancellation Hughes laid off 20% of its employees. No where to go from there but up! On July 9, 1960, less than a year after cancellation of the F-108, NASA awarded Hughes a contract for a competitive design study of a lunar soft lander to be known as Surveyor. Three other companies were also selected, McDonnell Aircraft, North American Aviation and Space Technology Laboratories, from the 37 companies that submitted proposals. Study reports were submitted in December. On January 19, 1961 Hughes was awarded a contract for seven spacecraft with the first to be launched in 1963. This was the very first contract that Hughes was awarded for a spacecraft design. Harold Rosen’s account of the Syncom development effort traces its origin to the cancellation of the F-108. In June, 1961 Rosen and Tom Hudspeth demonstrated satellite communications at the Paris Airshow. On August 11 only several months later NASA awarded Hughes a $4 million contract for the development of three Syncom satellites. Less than two years after the F-108 cancellation Hughes had contracts for two different spacecraft that would lead us into the race for space. We were on the way.